Ice erosion is the process of large chunks of ice, known as glaciers, eroding an area over a long period of time with the help of gravity. Following are some examples of ice erosion from throughout the world, when ice once covered the entire globe - and beyond. Tens of thousands of years ago on the group of islands now known as the British Isles, glaciers covered nearly everything. As they cut into the land, they created a completely new geographical landscape of hills and cliffs which can still be viewed today. Greenland, an area still known for its icy terrain, has many features that were carved out by ice erosion. One of the most notable examples is a large trough right down the middle of the country that was created by a glacier moving slowly over it. Glacial lakes are examples of ice erosion. They occur when a glacier carves its way into a place and then melts over time, filling up the space that it carved out with water. One such glacial lake is called Lake Louise, and is located in Alberta, Canada. The Mount Baker-Snoqualmie National Forest in Washington State contains many glacial valleys with their characteristic U-shaped cuts into the surrounding land. The national forests are home to more glaciers in the continental United States than anywhere else, and are second only to those glaciers found in Canada. Yosemite Valley, an area in the Sierra Nevada mountains of California, was carved out by ice erosion. The valley was home to glaciers for much of a 30 million year period, caused its deep cut into the landscape. Sediment from the ice erosion is visible in the rocks of the valley even today. Glacier National Park, which is located in the State of Montana, has mountains which began forming from ice erosion over 130 million years ago. 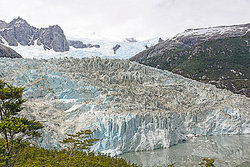 While the glaciers that eroded the park are gone for the most part, some are still able to be seen in the valley. O'Higgins / San Martin Lake in Argentina was carved out by ice erosion and eventually filled as the glacier melted. A portion of the original lake is still visible in Chile. Millions of years ago, the mountains of Tibet were carved out by glaciers. Remnants of these glaciers still fill the Tibetan landscape, capping some of their tallest and most magnificent mountains. Ice erosion is actually responsible for the largest glacial lakes in the world - the Great Lakes of the United States of America. Once ice erosion carved these bowls, the ice melted, creating the lakes that are visible from outer space. Speaking of outer space, the topography of the planet Mars is largely due to ice erosion. Glaciers are still on Mars, cutting paths through its landscape, and capping some of its most famous mountains. Moreux Crater, a very deep crater on the planet Mars, is believed to have been carved out of the landscape by glaciers that have since melted. Now you see that there are many different examples of ice erosion that have occurred on Earth and even in outer space. Ice erosion has shaped our world and these examples help to understand just how widespread the impact of ice erosion has been. "Examples of Ice Erosion." YourDictionary, n.d. Web. 18 April 2019. <https://examples.yourdictionary.com/examples-of-ice-erosion.html>. Ice erosion is the process of large chunks of ice, known as glaciers, eroding an area over a long period of time with the help of gravity. Following are some examples of ice erosion from throughout the world, when ice once covered the entire globe – and beyond.